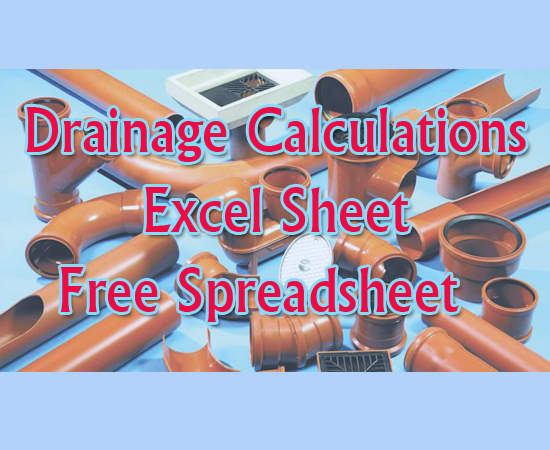 Download A Free Excel Sheet for Drainage Calculations. Free Spreadsheet for the design of drainage systems. The required number of borings and hydraulic conductivity tests for a pond. The required soil depth over a pond liner. Geometric elements of various cross sections and segments of a circle. Converts metric to English and vice versa and DRI to conductivity conversions. Converts Curve Numbers to coefficient of runoff numbers. Verifies the recovery time for an effluent filtration system. Rainfall intensity and allowable discharge in FDOT's Zones 1 through 11 for the 2 to 50 year events. The time of concentration using the kinematic wave formula. The required shelf size if the pond is larger than required. The required storage volume for a 2 to 50 year storm event in all 11 FDOT zones. Runoff by the NRCS method. The NRCS time of concentration. The required orifice size to discharge ½ the treatment volume in 60 hours or more. Slopes, volumes, velocities and capacities of pipes flowing full. Calculates pond volumes based on surface area and elevation. Generates rainfall hydrographs for input into other programs. Rating curves for compound weirs for input into other programs. Retention basin recovery time frames. The required sediment sump size. Provides a simplified pond (surface water management system) volume recovery analysis. Verifies the 24 hour bleed down requirement for a V-notch weir. Vegetative upland buffers for a residential storm water quality treatment alternative practice. Weir dimensions based on height, width or discharge rate. The bleed down time for a weir notch.